The following are answers to commonly-asked questions about the ScanSnap. For document storage using Office Manager, please consult the special FAQ. I can’t find the TWAIN driver. After a year of use I’m noticing more frequent multi-page feeds. How-to disable the Shift+Ctrl+Space hotkey? Can different models be connected to the same computer? I can’t find my driver CD, can I download it? The ScanSnap is a compact and - in our opinion - smart-looking document scanner made by Fujitsu. It is ideally suited for handling everyday documents in a wide variety of paper sizes. Together with the "Office Manager DMS" and FineReader OCR, both of which come pre-installed, the ScanSnap comprises a turnkey, worry-free digital archiving package. Why can’t I use the ScanSnap with other programs? I can not find the TWAIN driver. The ScanSnap operates as a stand-alone device. It is operated directly via the Scan button or through ScanSnap Manager. The device is not TWAIN or WIA-compatible and there is no TWAIN driver for the ScanSnap! Third-party applications, DMS and graphics programs cannot interface with the device in order to read in images. However, scanned files can be transferred to this applications. Tip: Office Manager features a special connection for archiving documents with ScanSnap. First, please check whether the device is turned on and the ADF paper chute is open. Also, double check that the USB cable is securely and correctly connected. Load the latest driver package. Close the ADF, wait fife seconds and open the paper chute. Open the ScanSnap Manager program group on the Windows Start menu. For newer driver versions you will see an entry marked ScanSnap Support Tool – please run this tool. A button labeled Restore is located near the top of the Restoring the ScanSnap connection section. Click the button. For older drivers, e.g. S500 and S510, this tool is not on the Start menu. In this case, open Windows Explorer and run the program SsDrvRepair-x64.exe. The program can be found e.g. in the folder "C:\Programme (x86)\PFU\ScanSnap\Driver\SsDrvRepair\". Make sure that the ScanSnap is connected, then click the Execute button. A progress bar will appear, followed by a status message. After a year of use I’m noticing more frequent multi-page feeds. Does the scanner need to be repaired? No. Normally you can fix this problem yourself. Increased frequency of double feeds indicates that the separation unit (pad assy) needs to be replaced. In the case of recurring paper jams, the pick roller should be replaced. Rubber parts wear out during operation and harden over time, and sliding paper can leave behind contaminants. The pick roller is designed to handle 100,000 sheets, while the pad assy is designed for 50,000 sheets. Before purchasing new spare parts, you can clean the rubber parts and try again. Also, pull the paper feed guide in the scanner’s lid all the way up so that documents can be freely pulled in. In our experience, the best way to resolve double feeds is to increase the pressure of the spring behind the separation rubber. 1 pick roller and 1 brake roller. Lifetime 200,000 sheets or one year. 1 pick roller and 2 pad assy. Lifetime 100,000 sheets or one year. The shift+ctrl+space key combination opens the ScanSnap Manager. This applies to the entire system and e.g. prevents the use of the same hotkey in Microsoft Word. To disable the key combination or re-enable it for other applications, please run "HotKeyDisable.exe" in the scanner driver’s program folder, e.g. "C:\Program Files (x86)\PFU\ScanSnap\Driver\HotKeyDisable.exe". Can different ScanSnap models be connected to the same computer? If you are using the old ScanSnap Manager: This is easily done since the drivers are backwards compatible. Assuming that you previously only had a ScanSnap S300 and that now you’d like to use the newer iX500 with the same PC, follow these steps: uninstall the S300 driver and install the newer driver 6.0 for the iX500. This now allows you to use both scanners, as well as any older models. 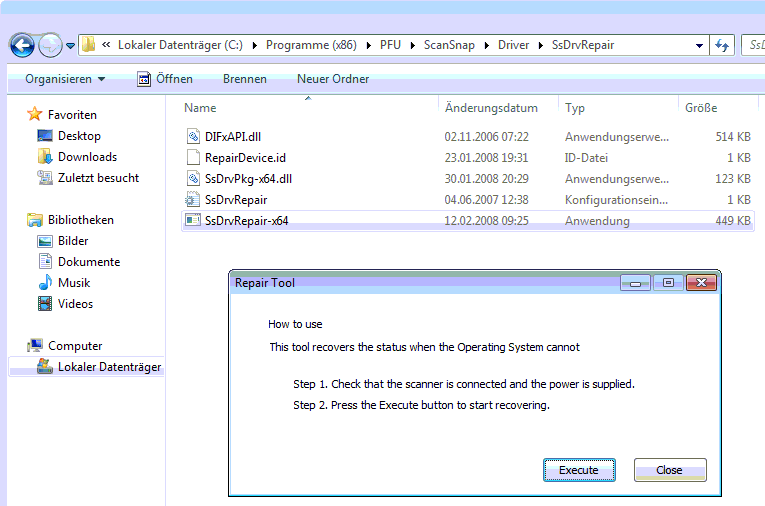 Driver version 6.0 for ScanSnap models up to the iX500 can be downloaded from Fujitsu. The easiest way to install updates is by using the command Help | Online Update in the pop-up menu . …can be found in the support centre (available only in German).